Meet Obama’s ideal woman. Her name is Julia. As told by Obama’s latest ad campaign, Julia’s parents didn’t teach her the alphabet or how to make friends; Head Start did. Her parents didn’t need to save for college, because she got a government grant and student loans (which she’ll spend a good portion of her adult life paying back). Her first job as a graphic designer didn’t have benefits, but that’s okay, because government provided free health care (since she couldn’t stay on her parents’ plan). Julia had free birth control—thanks to government. When she decided to have a baby, she had free prenatal care—thanks to government. Her son got the same great education she had—thanks to government. Julia started a small business—thanks to government. She retired with Medicare and Social Security—thanks to… well, you get the picture. Julia is successful, we are told. Her success is not because of her loving family, a supportive church, or a strong local ties—but because big government maintains a lavish welfare state. She is no ideal American woman. She is not the self-governing woman America has long been known to have. American women were the first to exercise the right to vote in human history (in New Jersey in 1797). Alexis de Tocqueville in Democracy in America praised America for its women. Unlike aristocratic girls from Tocqueville’s day, the American girl “thinks for herself [and] speaks freely.” Her family arms her with reason. She is a self-governing woman able to identify vice, virtue, and opportunity. She belongs to a family, a church, and private associations. But not Julia. She needs the helping hands of thousands of bureaucrats to fulfill with expert precision every want in life so that she can retire and putter around the community (organized) garden. There’s a bureaucrat to determine the Head Start curriculum, one for primary school, one to approve her college grant, another to determine what health care she gets at every age and stage of life. President Obama wants to keep it that way. With the President’s campaign, Julia now means dependence upon government for education, health care, and meaning in life. But the name Julia actually means “youthful, energetic.” It’s a great name that belongs to many self-governing women across America—who put themselves through school, marry, raise children, volunteer at the local church or charity, and run their own businesses (despite miles of red tape). It’s the responsibility of every citizen—not just the Julias—to resist the tyranny of the burecratic state and ensure that the ideal citizen (man or woman) remains a self-governing one. 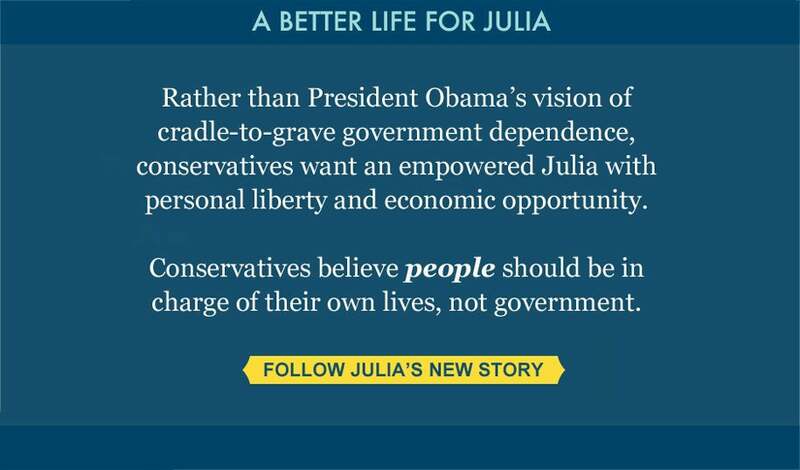 Heritage has revised the original Julia to show how conservative policies, like the ones outlined in Heritage’s Saving the American Dream plan, can empower her and all Americans without government interference at every stage of life. Click through to view our version of the slideshow and let us know which vision for America you prefer in the comments.